Thanks to my kindergartener, I now know the best ways for kids to make money: by tricking other kids. My five year old is obsessed with making money. When we do the lemonade stand at the end of our driveway, he's the one who hustles to the park to remind people how thirsty they are. He came home from school a few weeks ago with some artwork and told me I could have it for 25 cents. Later when he talked to his grandparents on the phone, he told them the price was $3.00. 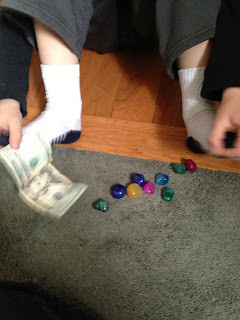 On Monday of this week, he took some colorful polished rocks to school and told everyone how "rare" they were and he would only sell one for $20. I didn't know about this. (Yes, I am not a helicopter parent, I'm more of a hang-glider, sort of skimming over what they're doing.) But imagine my surprise when he got off the bus on Tuesday proudly waving the $20 bill that he got in exchange for one shiny rock. Several local entrepreneurs that I shared this story with were impressed. And yes, I'll admit some small satisfaction that my middle son seems to know the better side of the deal, unlike my older son when he was trading LEGOs. I called the parents and left a message explaining that the money would be returned. Did I do the right thing? Am I teaching my kid right from wrong or stifling an innate talent for making cash?